Players are congratulated by Bangladesh’s Shabbir Rahman Roman and Bangladesh’s Taskin Ahmed after winning their Cricket World Cup quarterfinal by 109 runs in Melbourne, Australia. Bangladesh’s Nasir Hossain hits the ball while batting against India during their Cricket World Cup quarterfinal match in Melbourne, Australia. Bangladesh’s Mushfiqur Rahim walks from the field after he was dismissed for 27 runs during their Cricket World Cup quarterfinal match against India in Melbourne. Bangladesh’s Mushfiqur Rahim plays a shot during their Cricket World Cup quarterfinal match against India in Melbourne. Players celebrate the dismissal of Bangladesh’s Mahmudullah during their Cricket World Cup quarterfinal match in Melbourne, Australia. 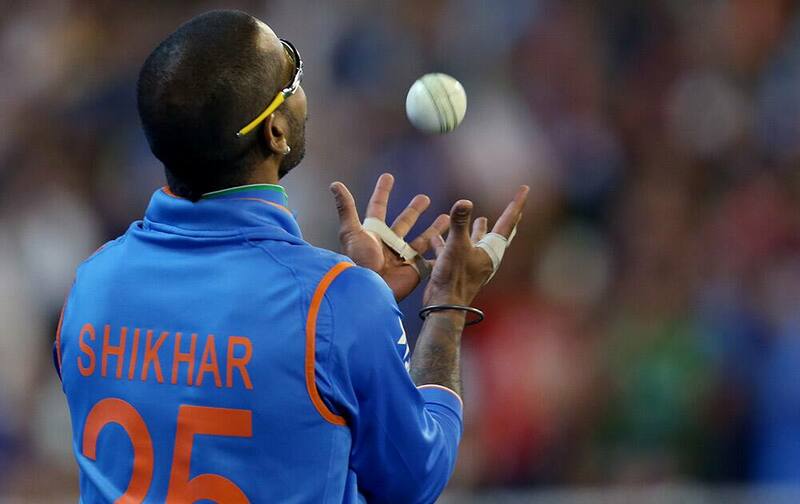 Shikhar Dhawan takes a catch on his second attempt to dismiss Bangladesh’s Mahmudullah during their Cricket World Cup quarterfinal match in Melbourne. 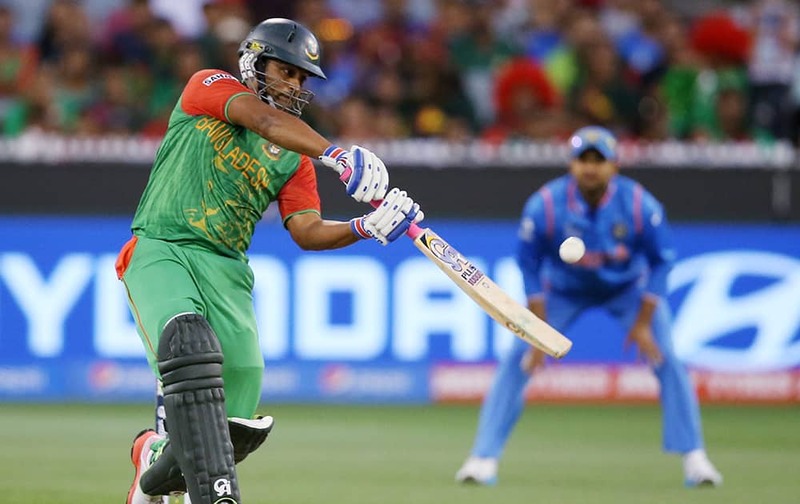 Bangladesh’s Mahmudullah hits the ball while batting against India during their Cricket World Cup quarterfinal match in Melbourne. 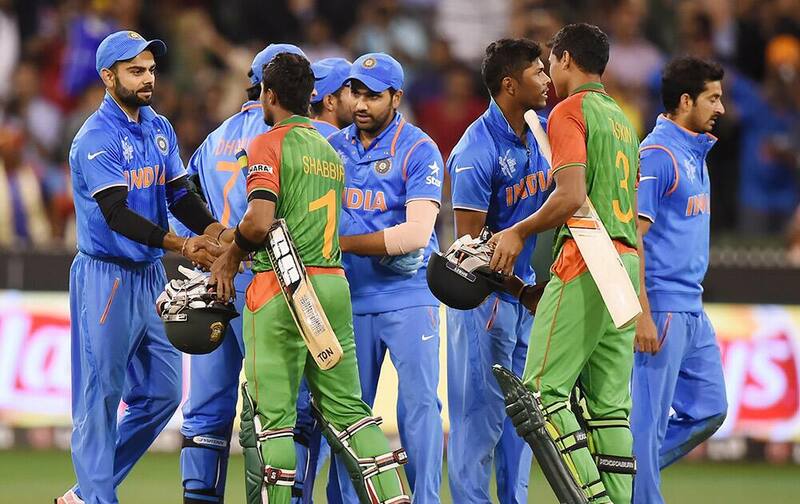 Players celebrate the run out of Bangladesh's Imrul Kayes during their Cricket World Cup quarterfinal match in Melbourne. 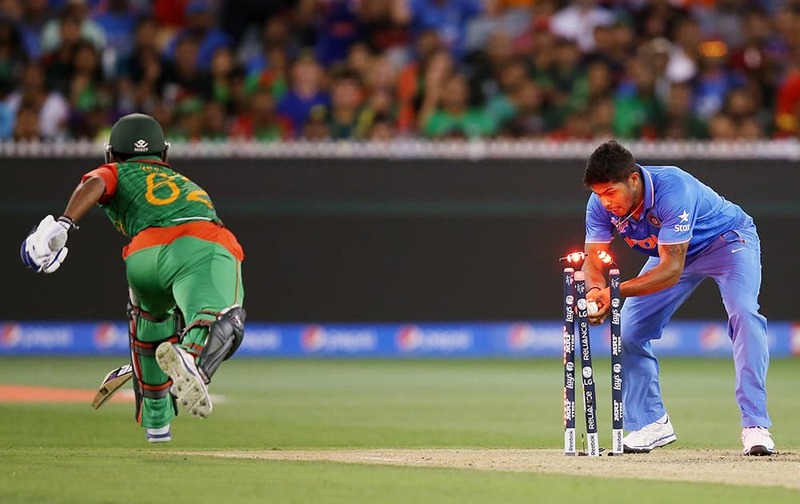 Umesh Yadav, runs out Bangladesh's Imrul Kayes during their Cricket World Cup quarterfinal match in Melbourne, Australia. Umesh Yadav, celebrates after taking the wicket of Bangladesh’s Tamim Iqbal, during their Cricket World Cup quarterfinal match in Melbourne. Bangladesh’s Tamim Iqbal plays a shot while batting against India during their Cricket World Cup quarterfinal match in Melbourne, Australia. Bangladesh’s Taskin Ahmed celebrates with teammate Mushfiqur Rahim, left, after dismissing India's Rohit Sharma during their Cricket World Cup quarterfinal match in Melbourne. 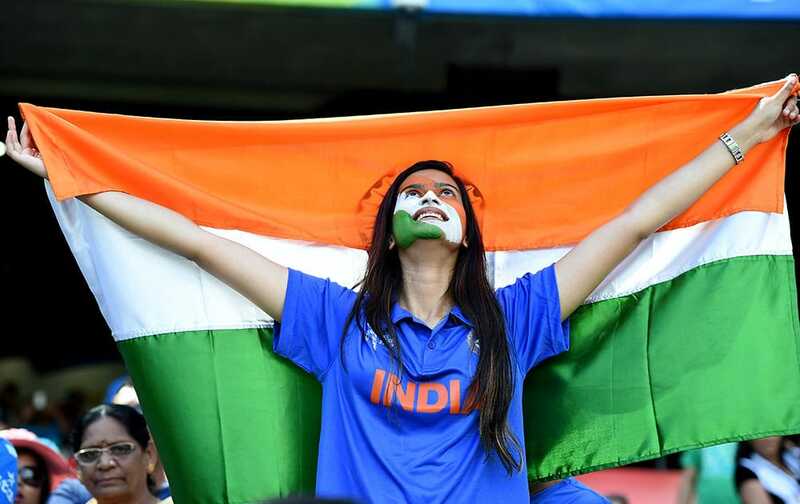 Rohit Sharma, celebrates after scoring a century while batting against Bangladesh as teammate Suresh Raina watches during their Cricket World Cup quarterfinal match in Melbourne, Australia. 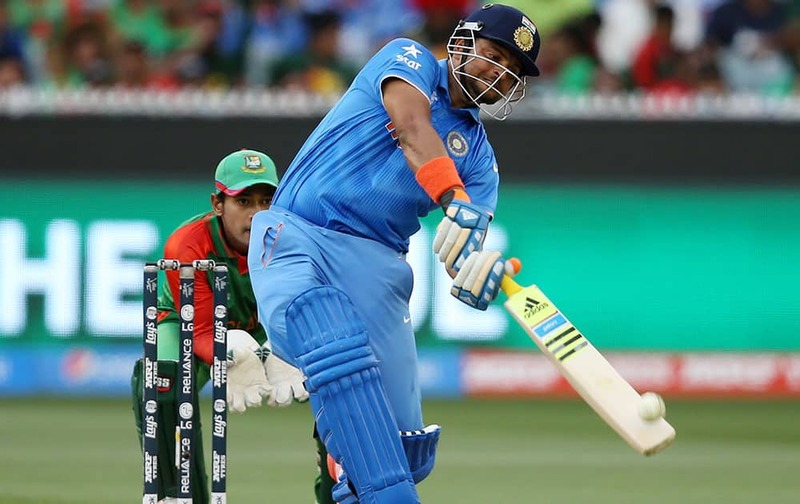 India's Suresh Raina hits the ball for six runs while batting against Bangladesh during their Cricket World Cup quarterfinal match in Melbourne, Australia. 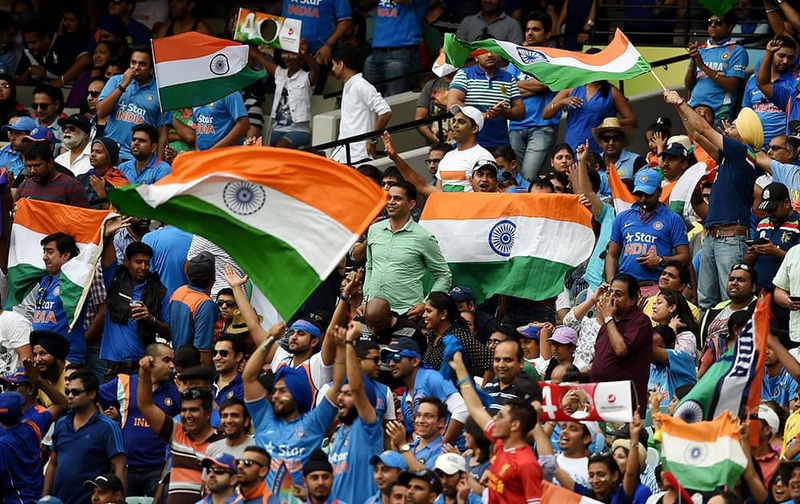 Indian fans wave their flags as they cheer their team during their Cricket World Cup quarterfinal match against Bangladesh in Melbourne, Australia. Bangladesh’s Shabbir Rahman Roman rests on the ground during their Cricket World Cup quarterfinal match against India in Melbourne, Australia. 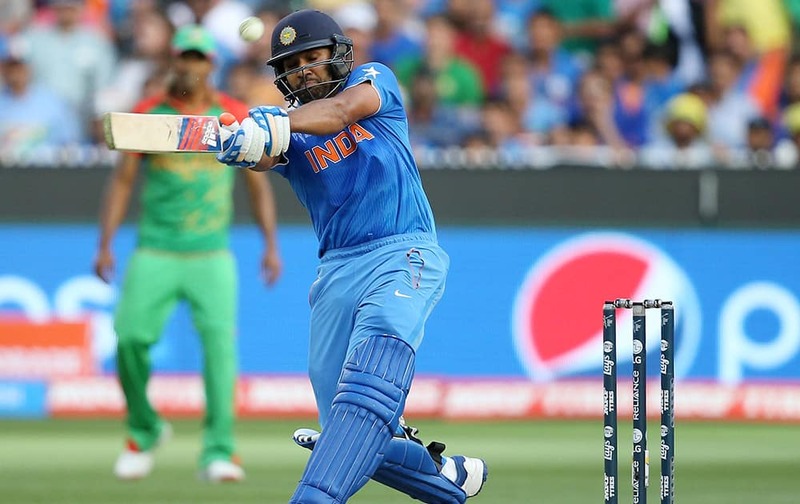 Rohit Sharma waves his bat after reaching 50 runs while batting against Bangladesh during their Cricket World Cup quarterfinal match in Melbourne. Bangladesh’s Taskin Ahmed, celebrates with his teammate Mashrafe Mortaza after taking the wicket of Ajinkya Rahane during their Cricket World Cup quarterfinal match in Melbourne. Ajinkya Rahane, watches the ball while batting against Bangladesh during their Cricket World Cup quarterfinal match in Melbourne. Bangladesh’s Rubel Hossain celebrates with teammate Mahmudullah and Nasir Hossain after taking the wicket of India's Virat Kohli, right, during their Cricket World Cup quarterfinal match in Melbourne, Australia. Bangladesh’s Rubel Hossain celebrates with teammate Mahmudullah after taking the wicket of India's Virat Kohli during their Cricket World Cup quarterfinal match in Melbourne, Australia. India's Shikhar Dhawan walks from the field after he was out stumped during their Cricket World Cup quarterfinal match against Bangladesh in Melbourne, Australia. 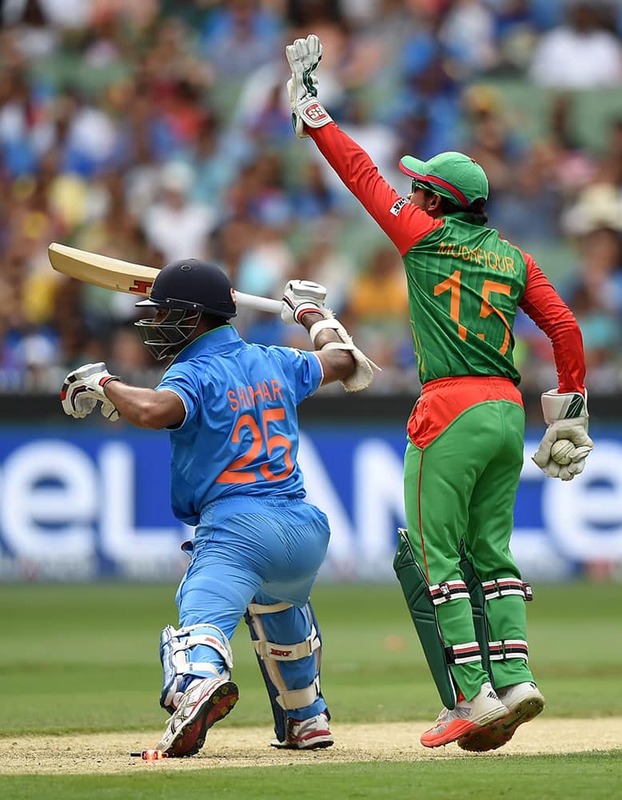 Bangladesh’s Mushfiqur Rahim appeals successfully for the stumping of India's Shikhar Dhawan, left, during their Cricket World Cup quarterfinal match in Melbourne, Australia. 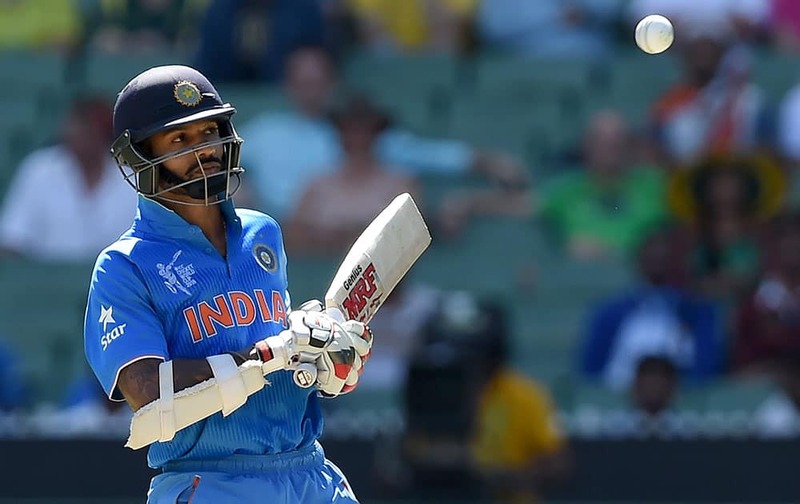 India's Shikhar Dhawan lets a ball pass while batting against Bangladesh during their Cricket World Cup quarterfinal match in Melbourne, Australia. 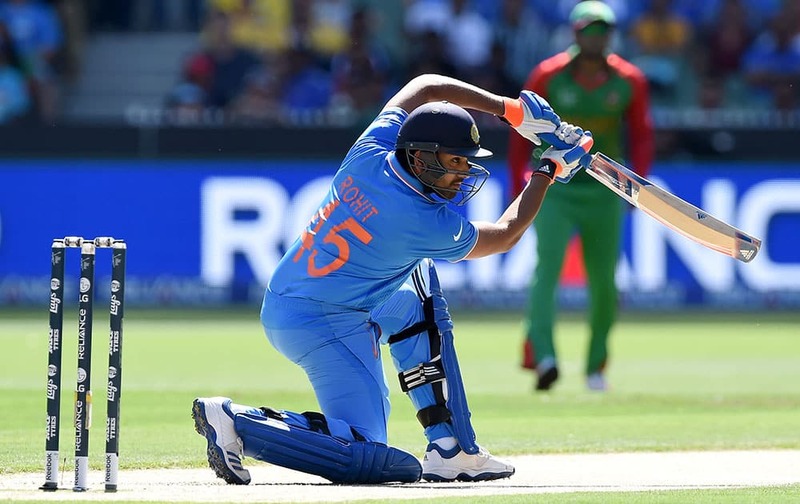 India's Rohit Sharma plays a shot while batting against Bangladesh during their Cricket World Cup quarterfinal match in Melbourne, Australia. Bangladesh’s Nasir Hossain reaches out to field the ball during their Cricket World Cup quarterfinal match against India in Melbourne, Australia. 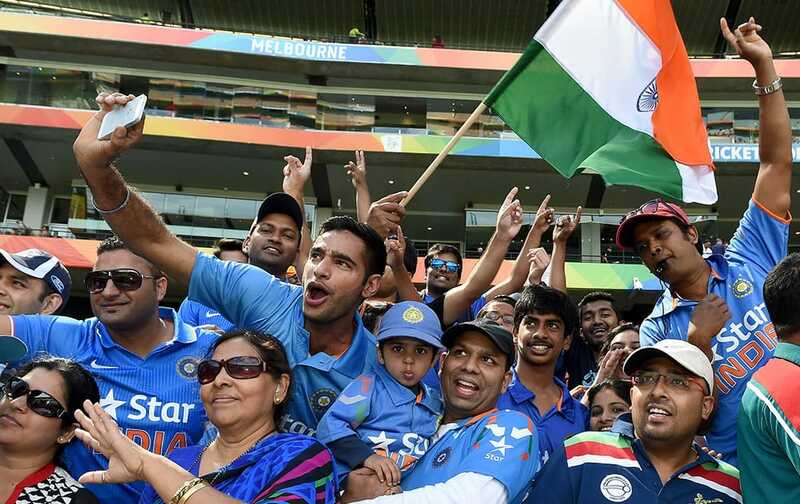 Indian fans wave flags and cheer their team during their Cricket World Cup quarterfinal match against Bangladesh in Melbourne, Australia. 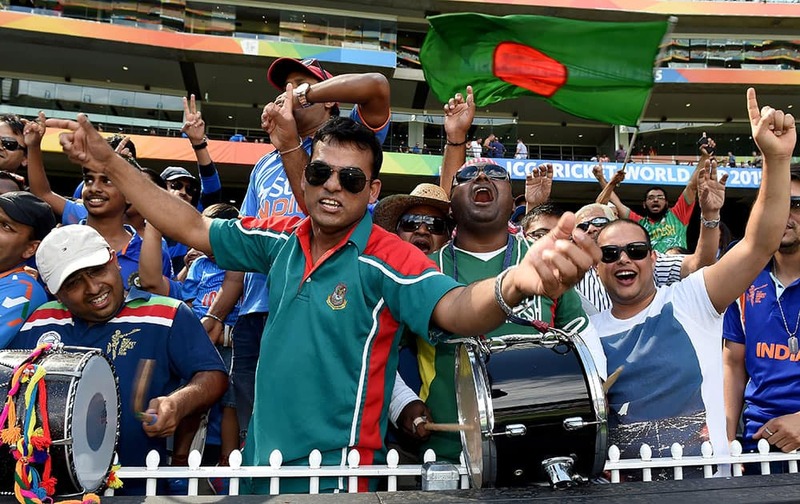 Bangladesh fans wave flags and cheer during their team's Cricket World Cup quarterfinal match against India in Melbourne, Australia. 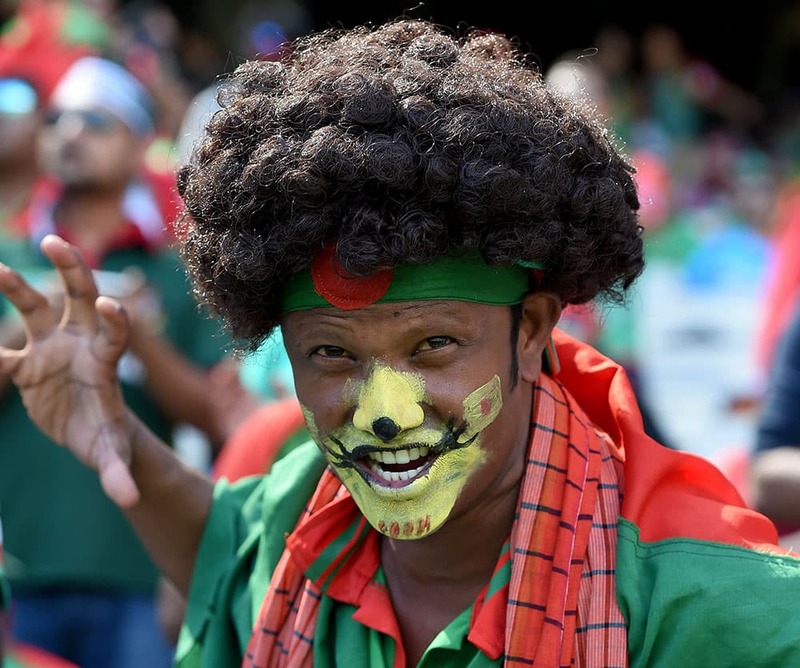 A Bangladesh fan cheers his team during their Cricket World Cup quarterfinal match against India in Melbourne, Australia.